Ask any aquarium owner and they will tell you that the worst part of owning an aquarium is cleaning. As much as fish are beautiful and perhaps graceful pets to own, cleaning their tiny homes can be a big pain. Nonetheless, cleaning is an important part of maintaining a healthy life for your tiny companions. So, it goes without saying that it must be done and done correctly. Luckily, thanks to technology cleaning your aquarium has never been easier. This is enabled by next level canister filters that not only clean your fish’s home but also oxygenate the water making the environment even more conducive. We will be handling every little detail about canister filters including how to spot a fake from a mile away. We will also help you get the right one for your aquarium no matter its size and most importantly, a thorough run down of top canister filters which are quite capable of providing excellent service at a pocket-friendly price. 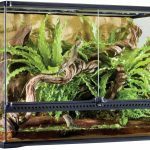 So, if you are tired of cleaning your aquarium with a brush or constantly replacing the water in your fish tank, I say it’s time to switch things up! Tropical fish are a very unique and interesting home decoration. Examples of these are goldfish, clownfish, and zebrafish. To grow and look beautiful all the time, they need to live in a well-maintained aquarium. Moreover, the water needs to be kept pure and oxygenated Fluval External Filter is one of the best aquarium filters for this job. This is a water filtration system that can be used with both freshwater and saltwater aquarium systems. It is applicable for aquariums that have a capacity of up to 45 gallons. To ensure a great consumer experience, this filter is fitted with an Advanced Motor System that enables quiet operation. The aquarium filter has a strainer that is clog-proof which ensures that the water is filtered effectively. In addition to all this, it is fitted with a dual layer foam screen. These parts work together to ensure effective performance of the machine by enabling thorough cleaning. 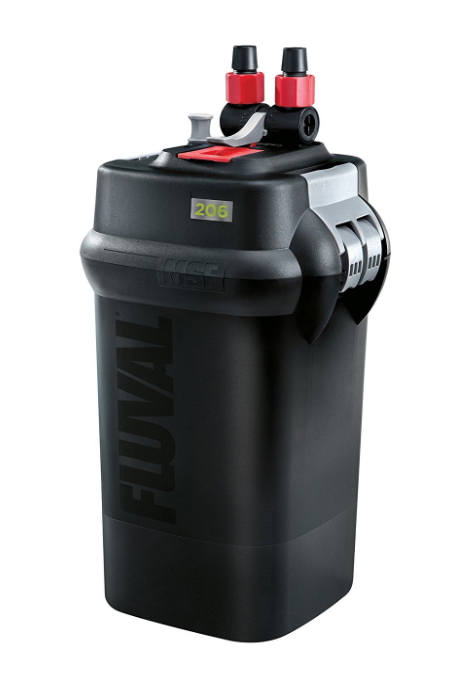 The Fluval External Filters can hold between 35% and 50% more capacity than round shaped canisters of a similar size. Moreover, they utilize a complex flow path that maximizes contact with your aquarium water ensuring thorough filtration. The Fluval External Filter can be used with small to medium sized aquariums. In addition to that, the unit can be utilized for biological, chemical and mechanical filtration tasks. There are four sizes of filters provided to you as accessories on purchasing the system. Each successive size goes on to increase the filtration capacity and flow rate. As a result, you can control the purity of the water in your aquarium. The cover on this aquarium filter does not stay firmly on the system during use. Due to the vibration of the Fluval External Filter, the cover hardly stays on the system. This causes a risk of leaking or water pouring out. The cover should have a firmer fastener. It may leak at the point where the hose meets the fixing fittings. Some consumers have complained that the O-rings sometimes do not prevent water from leaking at the connection points. In order to save you the effort, the Fluval External Filter has an Aquastop Valve. This is a patented part that turns it off automatically when the water is completely filtered. The system comes with a variety of filtration baskets such that you can fit a new one when the current one is worn out. They are designed to be easily installed and removed on demand. As a result, you find it easy to maintain your aquarium system. 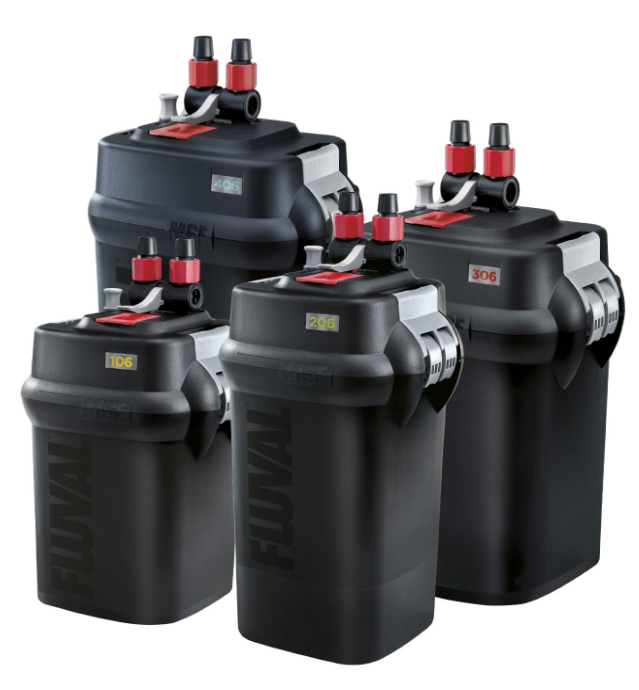 After purchase, you get a 3-year warranty for the Fluval External Filter. As such, you can be sure of manufacturer support for a long time after you begin using the unit. 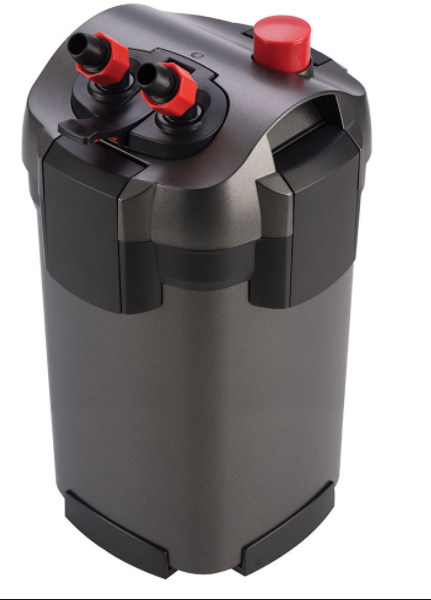 This canister filter was developed with a powerful motor that filters your aquarium water much faster than most other filtration systems in the market. To boost functional safety, the system has rim connector assembly parts. They ensure a firm connection of the intake and output hoses to your aquarium during filtration. Cleaning and maintaining this filter system is also quite easy. That is because you can disassemble it with lock clamps that can be opened with one motion. On purchasing the Fluval External Filter, you get an instant prime system, lift-lock clamps that can be operated with one motion, a clog-resistant strainer, foam screen that has two layers and a quick start manual. 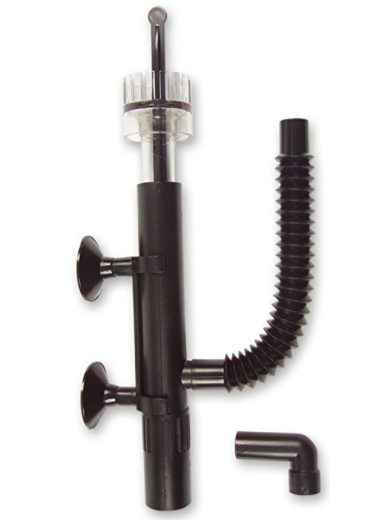 The Fluval External Filter is a powerful and effective piece of equipment. 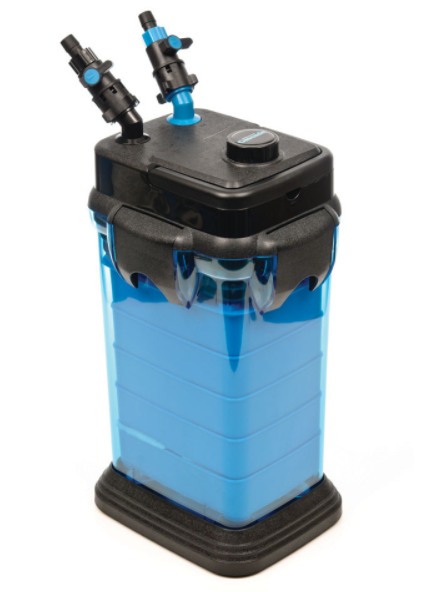 Developed to run silently, it can ensure that your aquarium water is constantly clean. Through the Aquastop Valve, the filter system can switch itself off once all the water is filtered. A collection of filter baskets come with the unit to provide replacements in case the ones that you are using get damaged. A quick start manual and 3-year warranty ensure easy start up and manipulation of the machine. That said, the Fluval External Filter is one of the best aquarium filter machines for anyone with an aquarium. It is important to keep the water in your aquarium clean. This ensures the survival and health of your tropical fish while keeping the entire unit attractive. The Flexzion SunSun External Canister Filter is one of the best aquarium filters for this purpose. This aquarium filter is designed for fish tanks that have a capacity of up to 75 gallons and can filter 1,000 liters of water per hour (264gph). Once you purchase this filter, you get three media trays that help you to add filtration media of your choice. Examples of these are ceramic rings, bio-balls, and activated carbons. As a result, you can achieve top biological, mechanical and chemical filtration. Built to be compact in size, the Flexzion SunSun External Canister Filter measures 10 by 13 by 15 inches in size. Moreover, it weighs only 9.8 pounds. This filter has three distinct parts. They are the filter unit, intake hose, and output bar. After assembly, the only parts that can be viewed inside your aquarium are the intake hose and the output bar. As a result, your fish tank looks neat. In an effort to ensure consumer satisfaction, this filter arrives with professionally labeled packaging. The box is sturdy and protects the unit from bumps that could occur during shipping. The manual is included as well as all required accessories. The suction system is sometimes troublesome to start up after cleaning up the filter system. This can be frustrating if you are only getting used to utilizing this filter. Some consumers have complained that the unit arrived with some parts broken already. Examples of such are the UV sterilizer and the plastic casing. The manufacturer may make these parts stronger or improve packaging. 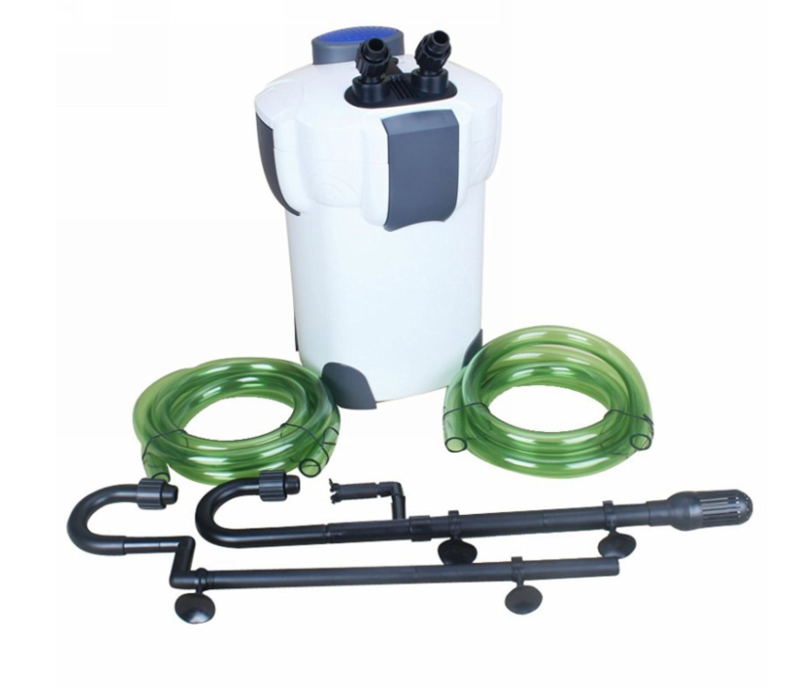 To help you begin the filtration process, the Flexzion SunSun External Canister Filter comes with hoses, pads and extra parts that are easy to manipulate and install. While a majority of the systems on the market require you to perform this task manually, this one comes with a self-priming pump. By turning it on, the filter siphons automatically. The Flexzion SunSun External Canister Filter is one of the few filters that are ideal for aquariums which have a capacity of more than 50 gallons. In addition to that, it is fully compatible with many inline accessories. Examples of these are UV sterilizers, inline heaters and CO2 diffusers on the outer part of the filter. In hiding the main technical parts of the filtration system, this filter keeps your aquarium neat unlike any other model would accomplish. 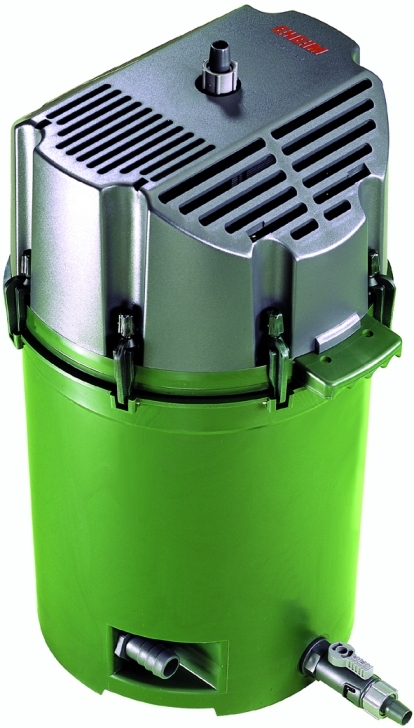 The Flexzion SunSun External Canister Filter is also quite easy to open up for cleaning. 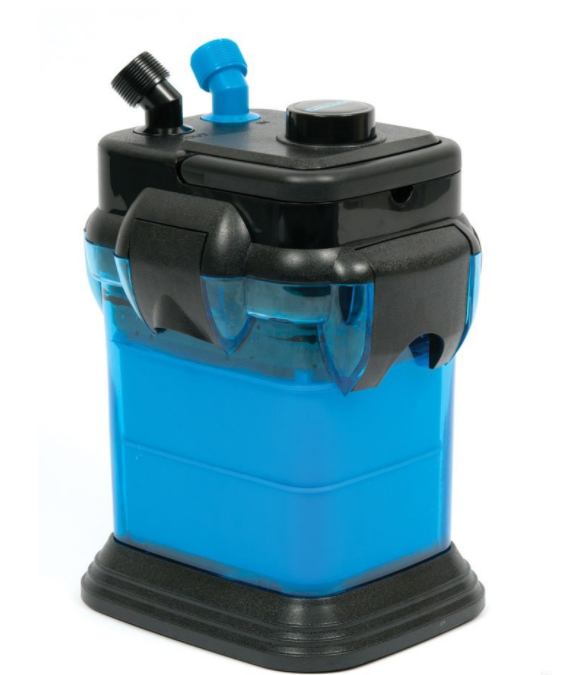 If you want the water in your aquarium to stay clear and always oxygenated, the Flexzion SunSun External Canister Filter is an effective unit to use. The machine is built for tanks with a capacity of up to 50 gallons. It is also designed such that you can set it up in your house with literally no parts in view. In addition to that, the filter is self-priming and compact in size. 3 different media trays accompany it to your home and the packaging is robust enough to protect it along the way. The Flexzion SunSun External Canister Filter is a good choice for aquarium owners around the world. 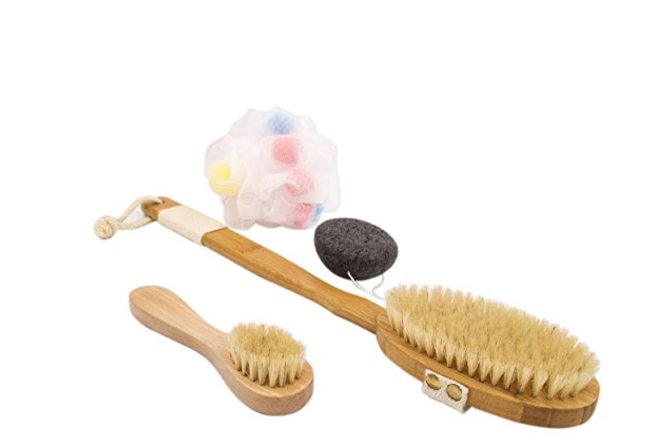 Hygiene is important for us and our pets. We need to keep our surroundings and their environments clean. For tropical fish, we can keep their tanks clean by using the Marineland Magniflow Canister filter. 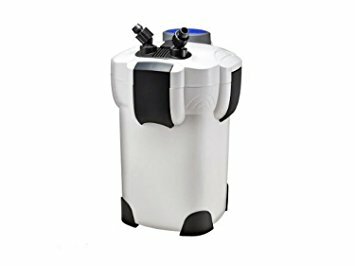 Capable of filtering tanks with a capacity of up to 30 gallons, this filter also leaves the water squeaky by removing any fine debris floating around it. While using this canister filter, you do not experience any spillage thanks to a watertight seal in the canister. In addition to that, the filter has special features such as bio-filter balls and ceramic rings that provide a large surface for the development of water-cleaning biospheres. After passing through the Marineland Magniflow Canister filter, the water in your aquarium is pristine. This is thanks to the Black Diamond Carbon in this filter that eliminated odors, discoloration and any impurities that could be present. In addition to that, the unit has some filter foam pads which are perfect for removing debris and dirt from your tank water. To ensure complete filtration of your aquarium water, this aquarium filter applies three methods of filtration. They are biological, chemical and mechanical. 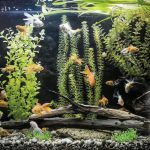 Working together, these methods ensure crystal clear water in your aquarium. The filter may stop working after a month or so of use. It gradually stops pumping water to the tank. No amount of cleaning corrects it and you have to get a replacement. Some consumers have complained about this. It can arrive with some parts missing from the package. This prompts extra purchases to get it running. The Marineland Magniflow Canister filter is built with a powerful filtration system that can be applied in both saltwater and freshwater aquariums. The system has 3 stages of filtration. As a result, a clean environment is maintained within your aquarium. This unit measures only 12.2 by 9.2 by 13.6 inches and weighs only 10 pounds. As a result, it is easy to carry around and install too. Its motor is powerful yet silent. You cannot hear any noise from it as 160 gallons are cleaned per hour. 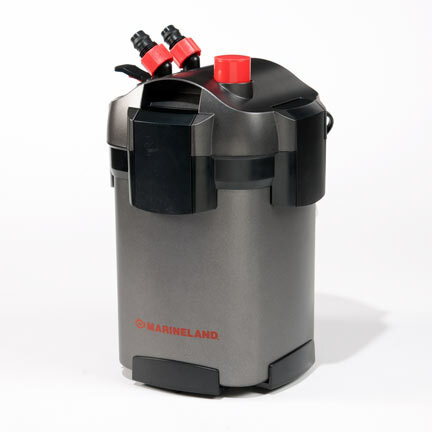 To help keep your energy costs low, the Marineland Magniflow Canister filter only utilizes 12 watts of power. As such, it is an energy efficient appliance. The parts of this filter are designed to promote easy setup and installation. The unit has a watertight lid with a sealing gasket placed at its top. There is also a self-priming button on the appliance too. To ensure quick release after filtration is complete, there are valve blocks in this aquarium filter. The positioning of its lid makes it quite easy to access the filtration baskets in the appliance. In addition to that, you can remove its entire valve block for cleaning instead of having to deal with individual valves and tubes. As a result, this filter is very easy to maintain. For efficient cleaning, the water in your aquarium should flow evenly through the biological, chemical and mechanical filtration layers. The Marineland Magniflow Canister filter is designed such that these parts all fit inside the Stack N’ Flo filter trays. This directs the water easily through the filtration media. If you want some crystal clear water in your fish tank, this is the filter to buy. It can comfortably handle a tank with a capacity of 30 gallons. While pumping the water at a rate of 160 gallons per hour, it keeps power consumption reliably low. As a result, the aquarium filter saves you money in electricity bills. It is a compact, sturdy appliance and can be used with freshwater or saltwater tanks. 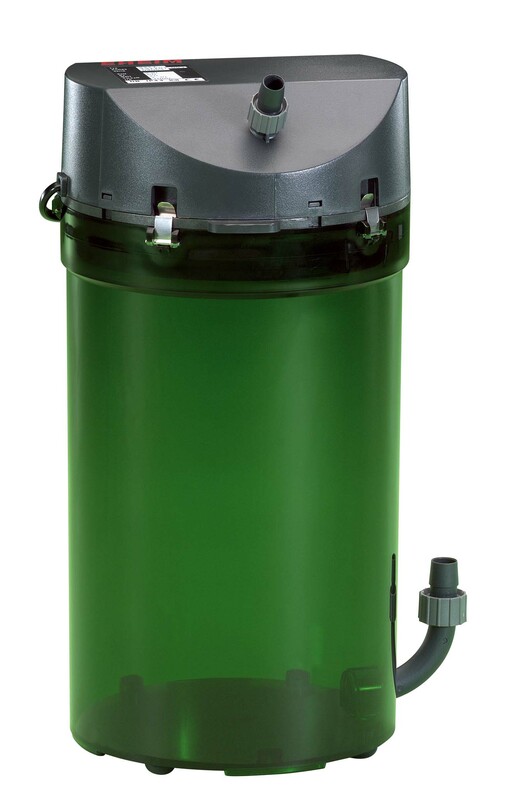 To enjoy reliable filtration of your aquarium water, the Marineland Magniflow Canister filter is a perfect choice. The Penn Plax Cascade Aquarium Filter can help give your fish a clean home thanks to the properties it possesses. For one, it has a durable, sturdy construction featuring a tip-proof base hence is one of the best aquarium filters. Siphoning the dirty water out of your aquarium is necessary for filtration. 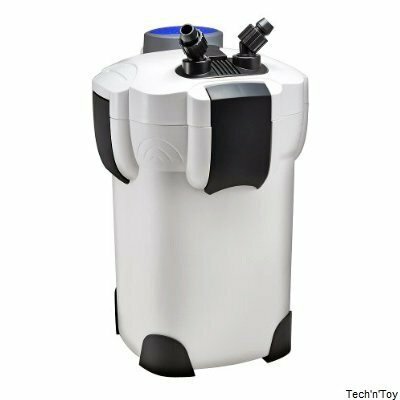 While some external filters require you to do this manually, this aquarium filter will siphon your tank at the push of a button. As such, it is capable of self-priming. The Penn Plax Cascade Aquarium Filter is built such that the intake and output valves can rotate 360 degrees. As a result, you can place it at literally any position around your aquarium and it will function. In addition to that, the filter is fitted with cut-off valves that adjust the flow of water automatically. 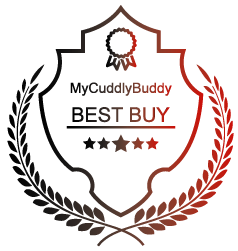 When you receive this filter at your home or office, the package contains all the equipment and accessories which are required. They are all easy to install and can begin working in less than half an hour after set up. If you feel the need to adjust the rate of flow, there are control valves and hose clamps like those of swimming pools to help you accomplish this. The Penn Plax Cascade Aquarium Filter is decorated in cobalt blue. This is an attractive color that can fit in with your fish tank. In addition to that, its rubber base keeps the machine stable while situated next to your fish tank. After purchasing this aquarium filter, you get filter trays that are large as well as tubing for input or output purposes. The large trays ensure that you can filter for longer periods of time without having to replace them. The pipes can start leaking without warning. Some consumers have complained that this aquarium filter started leaking barely a month after purchase. The filter has a heavy duty system for filtering your aquarium water that makes use of three stages of filtration. They include chemical, mechanical and biological stages. The Penn Plax Cascade Aquarium Filter can work with aquariums that have a capacity of up to 65 gallons thanks to a flow rate of 185 gallons per hour. Moreover, it can effectively filter fresh or salt water. There is an air tight seal at the points where the input and output tubes meet your tank that prevents leaking and keeps the filter running silently. For maintenance or cleaning, you can easily open up the filter using easy-lift clamps. Moreover, the unit is fitted with directional returns that make the waste water get suspended for easier removal. Measuring 15 by 10 by 11.5 inches, the Penn Plax Cascade Aquarium Filter is a compact machine. It is easy to handle since it weighs only 9.8 pounds. As such, it is an ideal filter for your home fish tank. 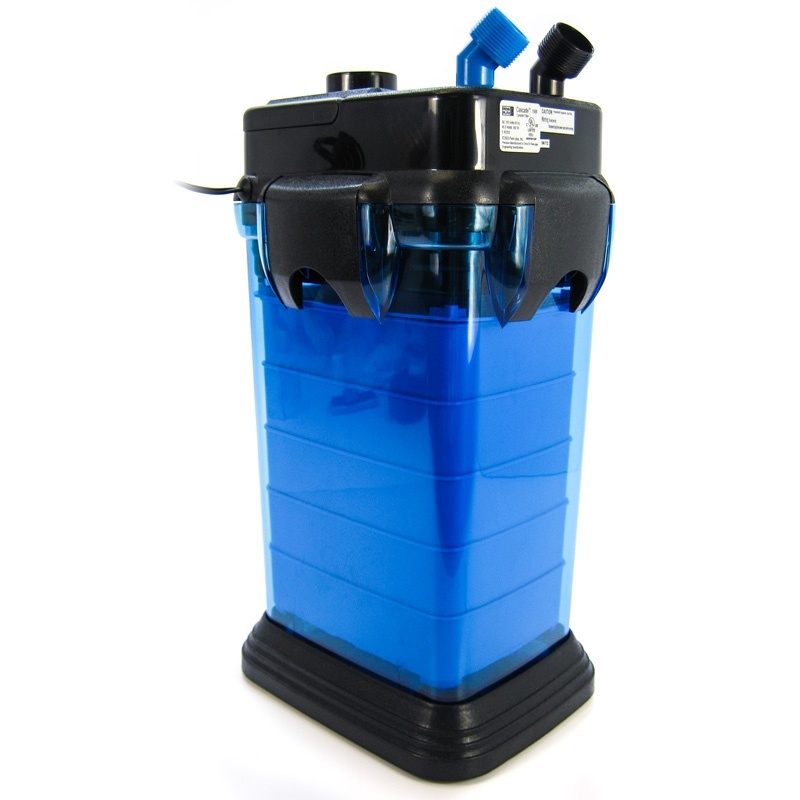 For reliable, powerful and stable aquarium water filtration, this is the unit to purchase. The Penn Plax Cascade Aquarium Filter is ideal for keeping your aquarium clean and water pure throughout. You can use it with fresh or salt water. The unit is light and compact hence can be moved from spot to spot without hassle. 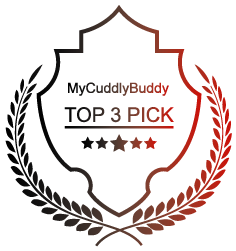 While affordable, it gives you value for money through a three-stage filtration system. This is a superb choice of aquarium filter today. For your tropical fish to stay healthy and strong, they need to live in a clean environment. As such, it is necessary to keep the water in your fish tank pure using the EHEIM Classic External Canister Filter. It is reliable and comes ready with all the accessories required for operation. They include an inlet pipe, spray bar a hose and some installation parts as well. To clean up the water in your tank, this canister filter uses special filtration media known as EHEIM Mech & Substrat Pro, it absorbs all the dirt and debris from incoming fish tank fluid and ensures only pure water is refilled in your aquarium. The valves required to fix this mechanism to your aquarium are provided on delivery. For the machine to work perfectly after maintenance, the lid needs to be fixed firmly on the filter. For this purpose, the EHEIM Classic External Canister Filter comes with a permo-elastic silicon sealing ring. It ensures that the pump head is firmly sealed after cleaning or maintenance. Maximum purity is further guaranteed by a set of filter sponges and filter media installed in the machine. Its instructions are very difficult to understand. With particular processes left unexplained, its manual is not much help and you have to rely on wit to set it up. The EHEIM Classic External Filter has been found to stop working shortly after you begin using it. For some consumers, it did not last for one year. It also leaks from the bottom. The EHEIM Classic External Filter is a legendary unit in the world of fish tanks. The technology embedded in it has been tried and tested. In addition to that, the aquarium filter maintains high levels of efficiency even when used in large aquariums. 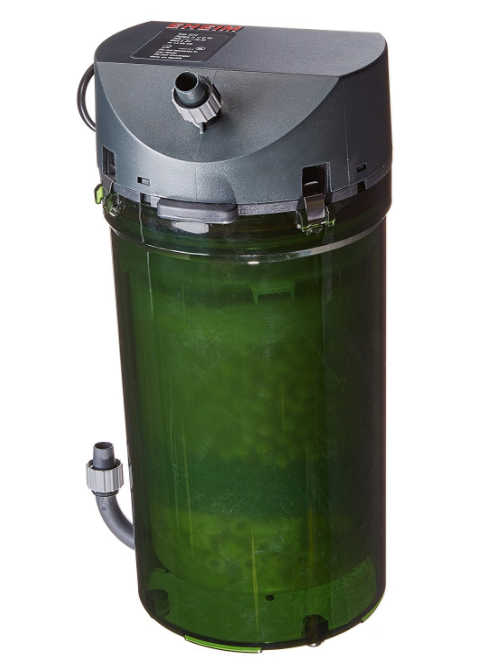 The purification system in this aquarium filter combines mechanical and biological methods. During this process, water circulation is boosted and oxygen is added to it. As a result, a perfect living environment for your tropical fish is created. Measuring 8 by 6.3 by 14 inches, the EHEIM Classic External Filter is compact in size. Its low weight of 4.5 pounds makes it easy to transport or store as well. The filter can handle a fish tank that has a capacity of 66 gallons quite comfortably. When you buy this external aquarium filter, you can be sure of durability. That is because the motor head is held in place within the canister by stainless steel clamps. The majority of other lower quality units use plastic ones for this purpose. The EHEIM Classic External Filter uses very little electrical energy. As such, you can benefit from its energy efficient mode of operation. Not only does it save your fish, it saves you money. For effective, two-step aquarium water filtration, the EHEIM Classic External Filter is the ideal machine to use. It uses a special media innovated by EHEIM to clean up the water in your aquarium. 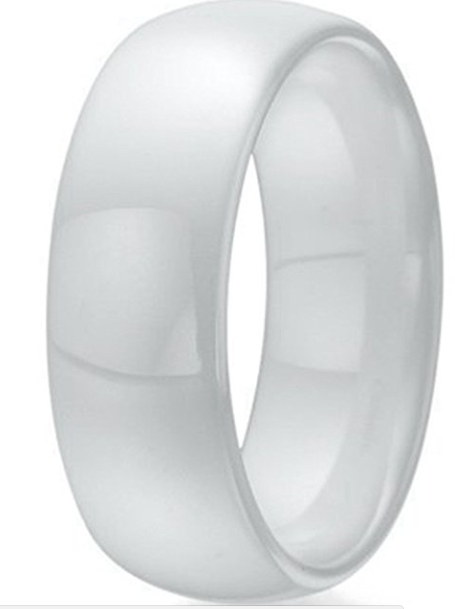 Moreover, it is compact, energy efficient and firmly sealed with rings in all surfaces which can be opened. If you are searching for an exceptional filter to use in your home or office, this classic model is the way to go. There are various aspects that you have to pay attention to when deciding which canister filter to purchase. A cheap filter may not have the best qualities that will guarantee a good job cleaning your aquarium. Here is how to differentiate between the two. A good filter is one that can perform both mechanical and chemical filtration functions excellently. This means that the filter should be able to remove even the minute debris and wastes from the water in the aquarium. The filter should be one that also prevents the dirt from getting back into the aquarium after being removed. When it comes to the chemical functions, a good filter should be able to remove harmful chemicals from the water thus leaving the water clean and well aerated for the fish and other creatures to survive. It is also advisable that aquarium owners purchase filters that can be used in more than one environment. This means that they can be used in both fresh and salty waters as well as planted aquariums and still remain effective. The filters also ensure that water and fish are not lost in the filtration process. This is another important aspect that will help you to distinguish a cheap and quality filter. Consequently, most of these properties will be absent in the cheap canister filters. Aquariums need to be subjected to regular maintenance so they can provide good environments for the fish and other aquatic creatures therein. Canister filters help achieve this purpose as they are used in cleaning the aquariums by filtration and therefore ensuring good hygiene standards are attained. Having chemicals in water can lead to ill health of the aquatic life. In the case where the creatures such as fish are reared for consumption, it is evident that human life will also be at risk. There are other ways that can be improvised to perform the task. However, they may not be as dependable and effective like the canister filters. There is, therefore, the need to own the canister filters by all aquarium owners. Some factors to consider when buying a filter are explained below. The larger the canister filter, the more likely it is to be efficient. This is because a larger body will allow the filter to hold extra media that in turn help in water filtration. The primary purpose of the media is to hold the dirt and debris that is collected from the aquarium. This is one consideration that should not be overlooked when picking a canister filter for purchase. The material that is used in making a filter plays a significant role in determining its durability. You should choose a filter that is made of a material which is resistant to the corrosive impurities that filters are likely to come into contact with. It goes without saying that the material should also be rust proof. This is an important consideration to make as the filters will be expected to stay under water some of which will be salty. Other than reducing your maintenance duties, it helps keep your filter durable for a long time. How noisy is the filter? The last thing you want is a filter that keeps humming or buzzing throughout the day. This not only disturbs you and those around you but is also quite a nuisance to your fish. A good filter ought to operate silently or if it must make some noise while working, let it be nothing higher than that of a running refrigerator. Most filters will indicate this in their specifications so make sure you pay attention before buying. In addition to a fitting horse saddle, you will need a perfect fit for you as the rider too in order to enjoy your ride. 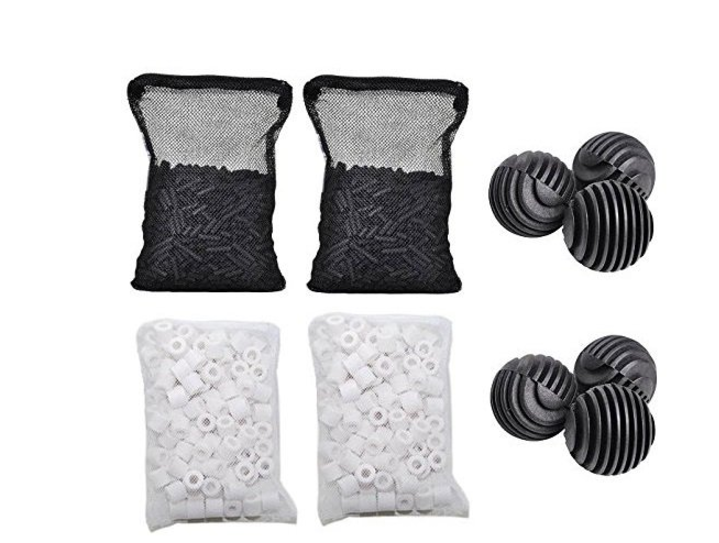 You will need something that will make you extremely comfortable so that you are seated in the correct position and to handle all the rocking that comes with horse riding. To ensure that as a rider, you end up choosing the best saddle, make sure you test and sit on as many saddles as you possibly can before purchasing one. Each time you test a saddle, you will gradually realize what size of saddle and what style fits you best. Some of the factors you will need to consider to get the best rider fit are the cantle height, stirrup position, seat size and the overall weight of the saddle. It is important to know that everyone has preferences when it comes to a horse saddle. What are yours? The higher the flow rate the faster the filtration process. You should choose a filter with high flow rates as this will ensure that the process takes place within a short duration and thus the fish and creatures in the aquarium are not disturbed. This also ensures that time and energy is saved. Sometimes the flow rates indicated in a canister filter will differ with the actual flow rates. This is due to the different aquarium capacities. You can get an accurate reading after purchasing your aquarium filter. This is nothing to worry about as the reading is often not too far from the actual one. The filtration media that accompanies the canister filters is an important factor to consider. This means that there is the need for the extensive research of whether the media will work well. The amount of maintenance that the media needs is also an important aspect to look at before purchasing a canister filter. You should buy a filter that requires minimal maintenance rather than that which will need maintenance in every few filtration cycles. The process of setting up a canister filter is another factor that should be considered. You should purchase a canister filter that will not be difficult to set up and assemble. The setup process should take the shortest amount of time possible. A canister filter should have strong mechanical filtration capabilities to remove all the unwanted contents as well as debris in the water. It should be able to filter all the unwanted material in water while acting to prevent the dirt from making its way back to the water. This, therefore, ensures that the environment is conducive for the survival of the aquatic life. Some filters also come with the ability to oxygenate the water. Check out the features of your filter before settling on one, you will greatly benefit from it. You should consider your budget and ensure that the purchase of the filter does not interfere with your budget. Most canister filters that are conferred with great upgrades will more often than not prove to be more expensive when compared to those that lack the upgrades. It is always good to keep your budget in mind lest you overspend. However, if you are looking for the best filter, you should be ready to spend more. I have seen fish being sucked into canister filters. It is quite heartbreaking, to say the least. If you want your fish to be safe then you ought to position your filter right as well as get one that is genuine. The safest bet is to get one that settles at the bottom of the fish tank. You can also get one that can be positioned behind the aquarium for safety reasons. Moreover, good positioning helps display your aquarium without blocking the view. So, consider this when going for a specific filter. This canister filter brand has been ranked as being the best brand in the production of canister filters. They have ventured into production of high quality and durable filters that suit the different needs of your aquarium. Apart from producing filters that perform efficient and effective services, the filters are made with a classy design that takes the beauty and decor of your house a notch higher. Fluval is aimed at providing good health to the fish and other pets that may be in the aquarium. The filters that are provided by the company have good chemical and mechanical filtration properties that ensure the water is dirt-free after a successful filtration session. Additionally, the filters that are manufactured by Fluval are suitable for both salty and fresh water environments. There are filtration systems and media that are suitable for the different environments. The filters ensure that the water is well aerated and therefore the fish and other pets that may be in the aquarium are not suffocated and therefore their health interfered with. Fluval builds its filters so they have a higher capacity so they can as well be used in medium and larger aquariums as well as the small ones. The support for the three stage filtration process is an added advantage for Fluval brand filters. This is yet another well-known brand that produces quality filters. The canister filters that are manufactured by this company are suitable for small, medium-sized as well as large aquariums. The range of products that are manufactured by Eheim ensure to cover all ranges of aquariums and are as well very flexible for the same purpose. The fact that the filters produced by the Eheim brand can be stretched or reduced to suit your needs is interesting and gives the products an upper hand in the market. Additionally, Eheim filters can be fitted with different additional media that will enable them to perform their functions well. All the dirt, food residues, as well as other debris that may include algae, can be done away with from the aquarium without much stress using the Eheim filters. The durability of the Eheim brand products is unquestionable as they are made to provide technical perfectness. This ensures that the performance is good. 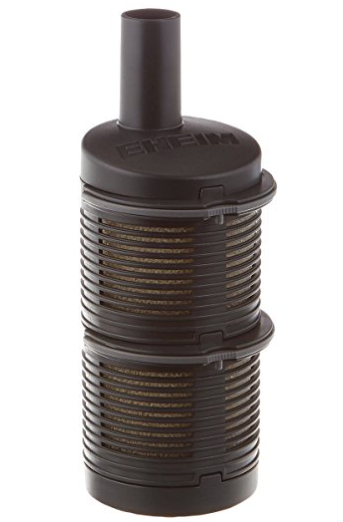 The fact that the Eheim filters also operate quietly is an added advantage and the flow rates speed up the filtration process. The quality products have seen the brand’s popularity rise in the market. Canister filters that are manufactured by this brand are of a high quality and are designed to keep your aquariums very clean thus providing a good and healthy environment for your fish to stay. The Sunsun filters work by cleaning the water in five filtration stages while ensuring all the impurities and dirt are removed. The Sunsun filters are manufactured in different sizes and are therefore useful for small, medium and large aquariums. Sunsun filters hardly produce any noise during their operation and this is desirable. Sunsun produces filters with a strong built that ensures they are long lasting. Additionally, the filters are efficient and convenient as they do not consume much time during starting up the process. Moreover, the instruction manual that accompanies Sunsun filters is detailed and easy to understand. 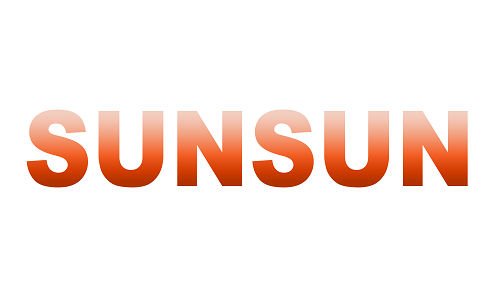 Sunsun ensures that their filters are extremely user-friendly therefore making the setup process of the filters pretty easy. An important feature that is present in Sunsun canister filters is the UV sterilizer which works well in aquariums that are a home for exotic fish. The sterilizer kills all the bacteria that might cause harm to your fish thus ensuring no harm for fish and plants that might be present in the aquarium. With over 40 years of experience in the saddle producing business, sabre has definitely made its unforgettable mark in the market. 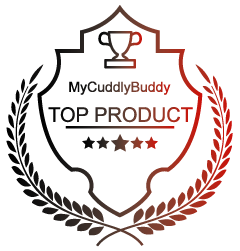 It provides the best quality when it comes to saddles. Usually, they employ traditional methods hence ensuring that they produce the best products for the rider and the horse. They are very comfortable and well fitted at a very affordable price. Just like other brands, the sabre saddles pride itself with the wide range of diverse saddles they offer. Some of the well-known saddles include Sabbre GP saddle; sabre 17.5”working hunter saddle VGC, dressage saddle and the general purpose saddle sabre. 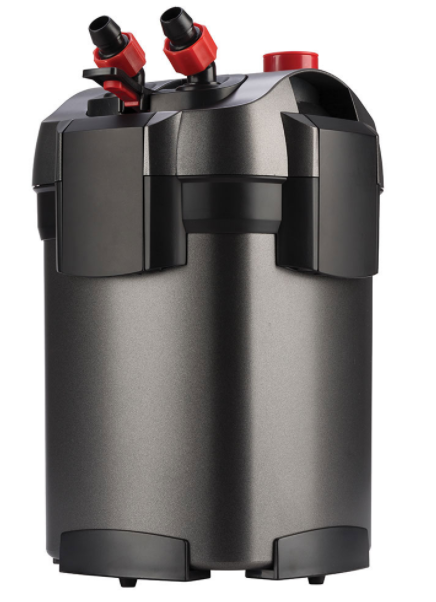 Cascade is one of the best canister filter brands in the market today and has managed to impress most users and therefore received less criticism. The brand has worked to always put its customer requirements first and this has seen the company grow while expanding its territories. The Cascade canister filters are more often than not suitable for large sized aquariums. The flow rates that the cascade filters are endowed with are high and they can, therefore, filter large amounts of water at a time. In as much as the cascade filters are larger as compared to other brands, they have always done a great job for aquariums. Important to note is the fact that the filtration process of cascade filters occurs in three stages. The mechanical, biological, as well as chemical filtration, is done excellently and you can be sure that all the dirt, food residues and chemical wastes are removed by the cascade filters. You would not have owned an aquarium were it not for a need to rear fish and other aquatic creatures. This is a pointer that the creatures in the aquariums are important. This is one reason why the water therein should be maintained regularly by filtration so as to provide a conducive environment for the survival of the creatures. Therefore, choosing a filter that suits your needs is an important step in the purchase of filters. How then do you choose one that will suit your needs? A larger filter will work well for large aquariums as compared to a smaller filter. It can also be noted that the larger the filter, the faster the filtration process. This will ensure minimal disturbance is caused to the fish and that time and energy are saved in the process. You will not want a filter that consumes a lot of time during the filtration process as this may render additional costs on the energy used. The media that are attached to filters are used to hold the dirt and other debris that are removed from the water during the filtration process. Reliable media implies the ability to hold all the dirt that is filtered from the water while preventing it from finding its way back into the water. There are mechanisms that are installed in the different media whose roles are the prevention of dirt from getting back into the water. This improves the reliability of the filter as well as the convenience of the filter. In as much as most filters will be accompanied by the media they need on a purchase, it is advisable to choose one that is endowed with additional media features. This is one important aspect of putting in consideration that will help you to settle for the right canister filter that will suit your needs. The higher the flow rate of a filter, the faster the filtration will occur. You will not want to spend a lot of time while waiting for the process to complete. In order to curb this, you will need to choose a filter whose flow rate is high as this will save you a lot of time. When you want to get the best saddle in the market, you will need to look into reliable brands. Most of these known brands have had years of experience in making saddles and therefore the chances of getting disappointed are very slim. Buying saddles from well-known brands is less risky and you are well conversant with the pricing and know what exactly to expect. The expertise that is used in manufacturing the saddles is exemplary and with the knowledge they have acquired over the years, they are in a better position to give the best saddles. I will be tackling the best saddle brands in the next segment. You should pick a filter that can be used both in fresh and in salty waters. This means that in cases where you decide to change the water you are using for your aquarium, your filter will still work and therefore no additional costs will be incurred. Such filters are also additionally resistant to rust. This feature makes them durable and you can, therefore, use them for long periods of time. Choose a filter that does not produce noise during its operation or produces minimal noise. Different brands produce filters that work differently. There are those that are noisy during operation and others that operate quietly. If you pick one that has quiet operation mode, you will be able to perform filtration without the fear of causing disturbance to other people within and in the neighborhoods. You can also be able to concentrate on performing other duties while filtration takes place. Select a filter that will be able to offer both chemical and mechanical filtrations efficiently and effectively. It is also good to ensure that the motor technology that is used by a filter’s manufacturer is modern. Many maintenance problems are therefore avoided by choosing a filter with the most recent technologies used. All the filtration functions are optimized therein and efficiency and convenience realized. Canister filters are the most efficient machines for cleaning your aquarium and maintaining dirt free aquariums. Just like any other machines, they have different parts and external accessories that ensure efficient functioning. Explore more about the canister filters and its parts below. The filtration process may not be in a position to remove the organic matter that could accumulate on the surface of your aquarium. This is where this accessory comes in handy. The tool has proved useful in removing the organic film that more often than not may be seen forming at the top levels of the water in the aquarium. The skimmers are made to suit the different sizes of the aquariums and you should, therefore, be keen to get one that suits your needs. This is a part that forms the outer layer of the filtering media. Its primary function is to increase the life expectancy of the filter media that may be reduced by the different chemicals that may be present in the dirt that is being filtered out of the aquarium. The Prefilter also acts to provide an inflow surface for the multilayer that is used in filtration. These are an important part of the canister filters. They are designed to hold all the impurities and debris as well as the chemicals that are filtered from the water during the filtration process. The media also play an important role in preventing the dirt and debris from getting back into the aquarium after getting filtered. There is need to have extra media so that all the dirt removed has no room to get back into the water. This is a part of the filter media whose function is to reproduce the good bacteria. This ensures that biological impurities are filtered and other wastes are well broken down. This, in turn, ensures that all the dirt is disposed of well. The replacement of this part should be considered after at least twice a year. These are also found in the media and act as filtration media for the mechanical dirt. They also act to disperse the water in different directions so that all the water passes through the filters. These rings additionally provide an environment where nitrobacteria can be broken down and disposed of. Whenever the dirt on their surfaces cannot be washed off by normal washing routine, a replacement should then be considered. There are different things that you need to be aware of when in possession of canister filters or when using them. The fact that you love your fish pets suggests that you would also like them to be handled in the right manner that supports their growth and survival. This is where the canister filters become useful as they clean the aquarium while improving the hygiene and hence the general health condition of the fish. Below are some of the tips and tricks of handling the canister filters. The canister filters have proved to be the most efficient and convenient filters subject to proper maintenance procedures. You are at liberty to choose the filtration type that you may want to subject your aquarium to with the use of filtration canisters. This is made possible by the customizable filter media that are present in the canister filters. The maintenance costs, as well as requirements of the canister filters, are lower than those of the corresponding power filters. This, therefore, means that after the purchase of canister filters, you will spend minimal time and resources for maintenance. Important to note is the fact that water loss is highly reduced during the filtration process. This is because water returns to the tank via spray bars and hence evaporation which enhances water loss does not occur. The maintenance of canister filters depends on the brands and models of each, however, despite the brand, there are some general practices that every canister filter will need. Since all canister filters allow you to use different filtration media, there is the need to maintain the media. The media could be in the form of baskets, media bags among many others. Other canister filters are equipped with some space that can be referred to as isolated chambers in which you can place the media of your choice. The media need to be washed regularly, typically after any filtration is done. This is to ensure that the dirt and debris from a previous filtration have no room for getting back into the water the next time the process occurs. The tubes also have to be maintained on a regular basis. The tube maintenance kits can be acquired from most stores. The manufacturers’ instructions may also contain instructions on how to additionally offer maintenance to the canister filters. The filters are made to draw water from the aquarium into an external chamber of the filter. The water is then made to go through a series of water filters where the dirt, debris, and other chemical impurities are removed. The direction of flow of the water is always dictated by the brand of the canister filters. The filtration of the water may be chemical, biological or mechanical and this hugely depends again on the filter media that you chose. After the water has gone through the filter media successfully, it is then pumped back into the aquarium. Most canister filters have water pumps that they use in the filtration process. Some may, however, require separate water pumps. It is important to understand the process since troubleshooting is made easier in the case where some problems are encountered during the process. 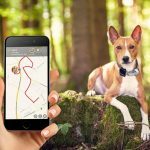 If you love your pets, then you are all about giving them a lovely and healthy home to stay in. the same goes for fish and other aquatic creatures. Keep their home clean and healthy and your fish will live longer. An aquarium filter enables you to do this without breaking a sweat. There are the tips and tricks that can be applied so that the filter system is well maintained and thus prolonging its expectancy. These mainly cover the parts that need maintenance and how to maintain them in a professional manner. The tips section also enlightens on some of the points to take note of when using the canister filters. 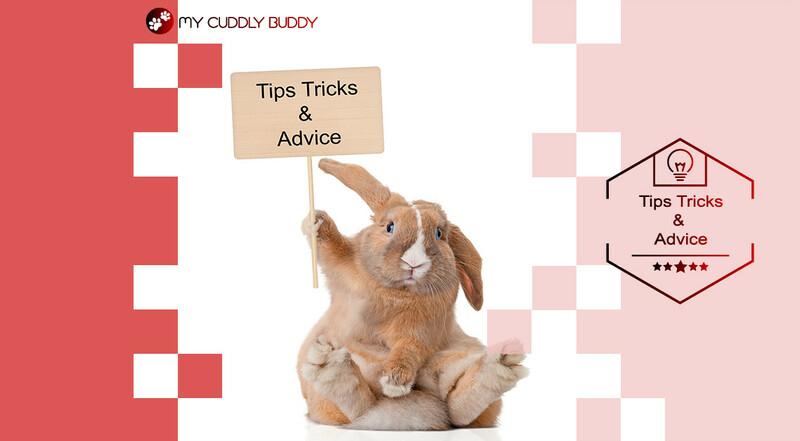 You might also get to learn how the canister filters work so you can be in a position to troubleshoot them accurately in case there is a problem. There are a variety of accessories and parts that can be used in the maintenance of the canister filters as explained above. Some companies are generous enough to give you free equipment while in most cases; you will have to pay for them. Finally, watch out for fake products and do some thorough research before settling on a specific filter.